Once upon a time, Georgia was home to a great nation. The Cherokee Nation lived on land in the northern reaches of the Peach State, with New Echota serving as the capital. After the United States Congress passed the Indian Removal Act, the Cherokee Nation gradually lost their land. In the summer of 1838, Cherokees were rounded up and forced from their homes in Georgia, Tennessee and other southeastern states to the tribe’s current capital in Tahlequah, Oklahoma. Of the estimated 16,000 Cherokees forced to make the journey to Indian Territory, an estimated 4,000 died due to exposure, starvation and disease. 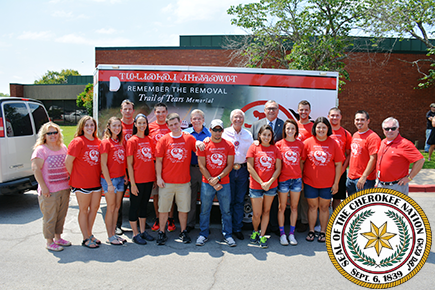 More than 30 years ago, the Cherokee Nation organized the "Remember the Removal" bike ride as a leadership program that offered Cherokee students a glimpse of the hardships their ancestors faced while making the same trek on foot. Starting 7 June 2015, twelve Cherokee Nation riders will meet up with seven riders from the Eastern Band of Cherokee Indians in New Echota, Georgia, and cycle across seven states before ending the 950-mile journey in Oklahoma on 25 June. “The Remember the Removal project ensures our tribe’s future leaders never forget our past or the sacrifices our ancestors made,” said Cherokee nation Principal Chief Bill John Baker. “This annual bike ride from Georgia to Oklahoma is mentally and physically demanding, and I admire these young people for taking on such a challenge." The riders from Cherokee Nation are Charles “Billy” Flint, Tristan Trumbla, Kayla Davis, Haylee Caviness, Tanner Crow, Shawna Harter, Maggie McKinnis, Wrighter Weavel, Caleb Cox, Alexis Watt, Tennessee Loy and Hailey Seago. The riders from the Eastern Band of Cherokee Indians are Kelly Murphy, Jake Stephens, Corlee Thomas-Hill, Kevin Tafoya, Darius Thompson, Savannah Hicks and Matt Martens. Follow the riders along the journey at www.facebook.com/removal.ride or with the Twitter hashtag #RememberTheRemoval.